When you choose to work with Discount Dumpster, securing your dumpster rental Scottsdale AZ is easy. Call our team of waste professionals and we’ll work to provide a seamless dumpster delivery to your job site. We take pride in delivering outstanding dumpster services, and we’ll always provide you with the lowest price. Discount Dumpster is working around the clock to deliver on time and at a low cost to our customers. If you have any questions or need any additional information, look at our detailed services pages, or call us and we’ll help you decide what type of dumpster rental is right for your project. I've worked with these guys a couple times in Scottsdale. It's always great service. Discount Dumpster is great. I use them all the time and highly recommend. They were easy to get ahold of, very friendly, and the dumpster was delivered quickly. Let Discount Dumpster become your trusted partner for dumpster rental Scottsdale AZ. We’re working hard for our customers to deliver dumpsters that exceed their expectations. Call our experiences trash crew to deliver a dumpster to your site that will help you with your important project. We’re confident we’ll provide a low price with the highest level of customer service. Our customers always know they can trust us with their waste disposal needs, and we continue to make them happy with their choice to work with Discount Dumpster! We have been around the block and are here to help with all your questions. 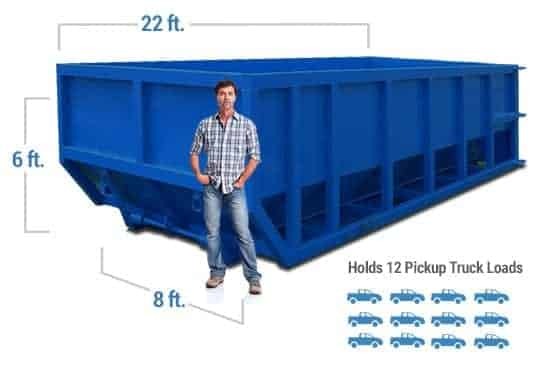 Not sure what size container will work for your project? Give us a call and we will walk you through the rental process and team you up with the right size bin. Stop overpaying with the other guys. We look forward to working with you. A dumpster permit may be required if the container will be blocking a public right of way. A right of way is a reserve over the land for transportation purposes, such as a road, sidewalk/public footpath, or no parking. In the City of Scottsdale it is rare to need a permit for your container but our staff is here to assist should the placement be in question. The permit process is simple and we will help you decide when and where a permit is necessary. The first place to check is the City of Scottsdale Permit Services. While most home improvement projects require a permit, you likely wont need it for the roll off dumpster. In fact the simplest way around pulling a permit is to place the bin on your private property. The most common placement is on driveways. This allows for easy disposal access and helps prevent neighbors from throwing their debris in as well.